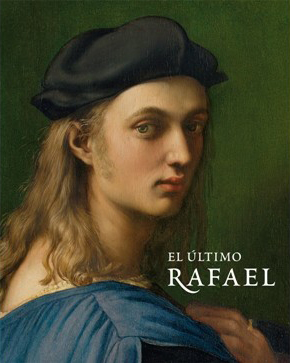 Late Raphael, is one of the most important exhibitions ever to be devoted to the artist and his studio and the first to focus on his final years, during which time Raphael became the most influential painter in Western art. 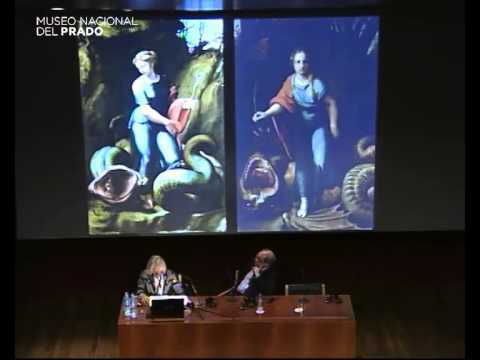 The exhibition includes a total of 74 works, the majority of them never previously exhibited in Spain. It presents a chronological survey of Raphael’s artistic activities from the start of the pontificate of Leo X (1513) to the artist’s death in 1520, as well as analyze the activities of his principal assistants, Giulio Romano and Gianfrancesco Penni, up to 1524. Late Raphael is the first major survey exhibition on Raphael (Raffaello Sanzio, 1483-1520) to combine paintings and drawings in order to focus on the last seven years of the life of the artist, who died in Rome on his 37th birthday. 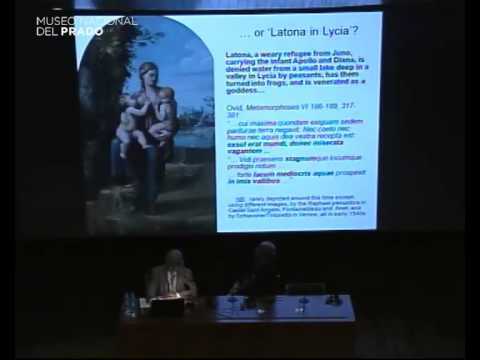 This was the period in his career when Raphael produced the work that would have the greatest subsequent impact on European art. Nonetheless, his paintings have not been fully understood due to chronological issues, to their disconcerting diversity and because the artist did not work by himself.The present exhibition aims to establish a clear definition of the boundaries between works executed by Raphael and those produced with the collaboration of his principal assistants, Giulio Romano (ca.1499-1546) and Gianfrancesco Penni (ca.1496-1528). It starts in 1513 by which date Raphael had been working in Rome for five years, decorating the monumental Vatican Stanze alongside other leading Italian artists such as Michelangelo (his principal rival, at that point working on the Sistine Chapel) and Sebastiano del Piombo, firstly during the pontificate of Julius II then for Leo X. With the change of pope Raphael took on a greater number of commissions both for Leo X and for other patrons and at this point began to employ a considerable number of assistants. His studio was very possibly the largest to date under the direction of a single great painter and eventually counted on 50 pupils and assistants./p>The exhibition presents the visitor with the highly efficient and effective results of this system, led by the remarkably versatile Raphael. In addition to producing easel paintings (the subject of this exhibition) he also executed frescoes such as those for the Vatican Stanze and for the Villa Farnesina, cartoons for tapestries (for the Sistine Chapel), and worked as an architect (continuing the construction of St Peter’s after Bramante’s death).The exhibition includes an unprecedented selection of forty-four paintings, twenty eight drawings, an archaeological item and a tapestry, loaned from around forty different institutions. 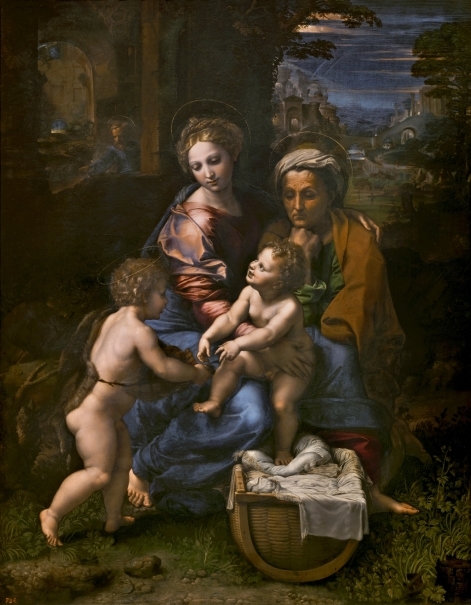 Visitors can see a chronologically structured survey organised into six sections that cover Raphael’s pictorial and aesthetic evolution and also presents a comparison of his final style with a group of works by his two assistants Romano and Penni, the latter produced both during Raphael’s lifetime and immediately after his death. This unprecedented opportunity for comparison allow for an identification of the degree of participation of Raphael and his assistants in these works while also helps to establish the latter’s intellectual and aesthetic contribution to Raphael’s oeuvre. 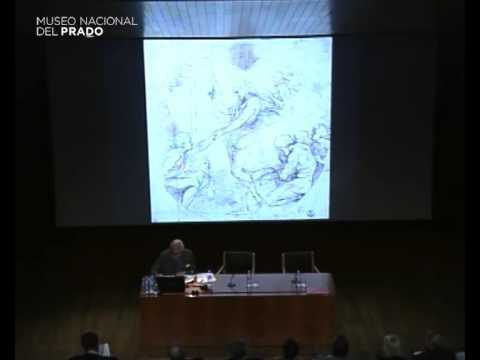 In this regard the almost thirty drawings that are displayed alongside the paintings play a key role in helping to identify Raphael’s hand, not only due to their absolute mastery but also because they reveal the original design and conception of his paintings.Among the most outstanding works that have travelled to Spain for the first time are the serene portrait of one of the artist’s friends, Baldassare Castiglione (1519), loaned from the Louvre, and the major altar painting of Saint Cecilia (1515-1516) loaned from the Pinacoteca Nazionale de Bolonia in which the viewer can appreciate the remarkable beauty of the figures and their perfect, harmonious composition, a level of achievement that Raphael attained during his time in Rome. 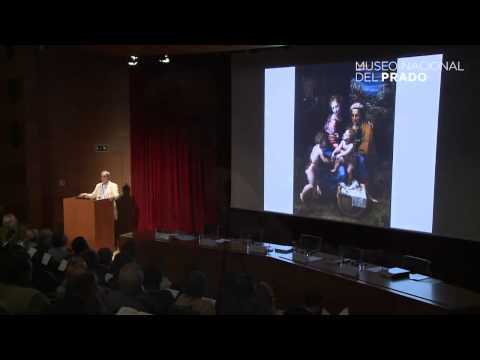 Also remarkable are the paintings from Raphael’s late period in the Prado’s own collection, including the panel transferred to canvas known as Lo Spasimo di Sicilia (1515-1516), which is on display for the first time since its restoration. The altarpieces that Raphael produced in Rome during Leo’s X’s papacy were all intended for export: to Naples, Palermo, Bologna, and France. They were executed for patrons at the highest level (such as King Francis I of France), or with excellent connections, and they served to spread the artist’s fame across Europe. Although most of these altarpieces were signed raphael urbinas (Raphael from Urbino) despite their role in publicising the artist’s name abroad they frequently involved significant amounts of workshop assistance and sometimes were even assigned entirely to an assistant. Only the Madonna del Pesce is a traditional Virgin and Child flanked by saints. 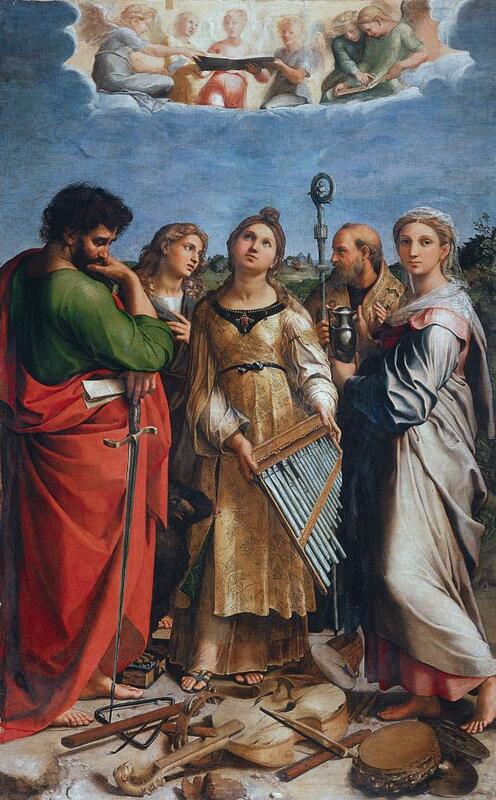 All the others, with the exception of the Santa Cecilia, are narrative compositions in which Raphael endeavoured to recast the traditional altarpiece in the dramatic new idiom that he was simultaneously bringing to fresco and tapestry design. 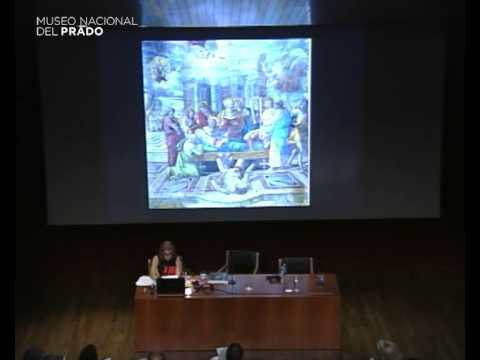 The cross-over with other media is especially clear in the Vision of Ezekiel, the painted version of which is very small but which was apparently developed while planning a large-scale narrative tapestry for Leo X (recently acquired by the Museo Nacional de Artes Decorativas, Madrid). The small panel and the tapestry will be show together for the first time. 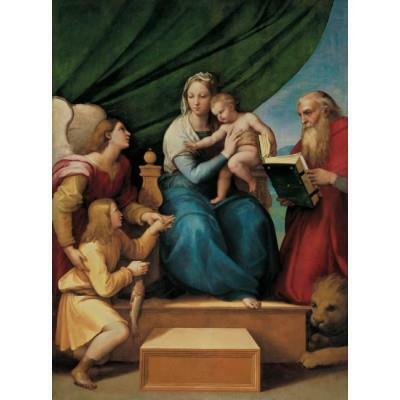 Raphael’s repertory in Rome included a few large paintings of the Madonna and Child, but many more variants on the subject of the Holy Family with the addition of Saint Joseph and sometimes also Saint Anne and the young Saint John the Baptist. 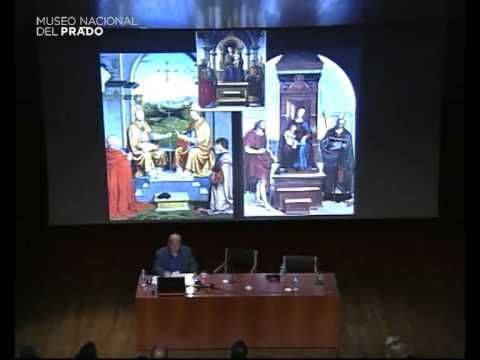 The distinction between these larger panels and altarpieces is not always clear and some of the Holy Families were probably installed as altarpieces in private chapels; they could also have been displayed in private residences. There is much uncertainty regarding the dating of these pictures and the extent to which Raphael’s assistants participated in their execution and planning; although some, such as the Perla, are among his greatest masterpieces. 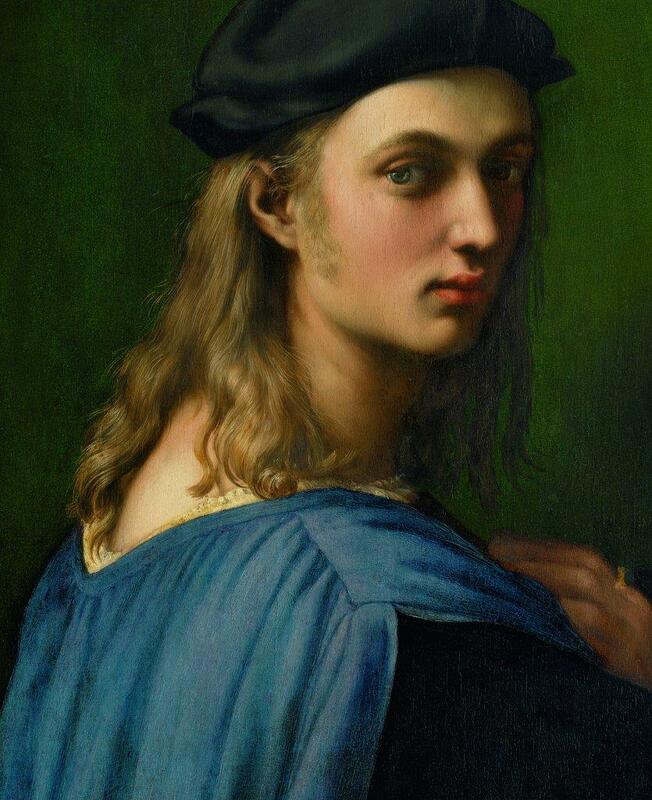 Throughout the period Raphael was under extreme pressure and he often delegated aspects of his work to his shop and especially to his two most trusted assistants, Giulio Romano and Gianfrancesco Penni. However he generally kept firm control of his workshop’s production, at least in the pictures which went out under his name, even if the times and ways in which he delegated were not always straight-forward. Raphael had even less time for the production of smaller, less important, compositions of the Madonna and Child and smaller Holy Families. 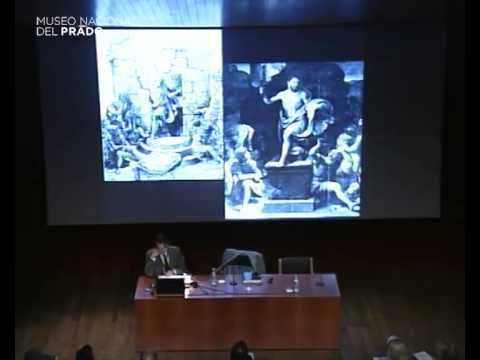 As a result, it is in these pictures that one can first identify and best appreciate the individual contributions of Giulio Romano and Gianfrancesco Penni. 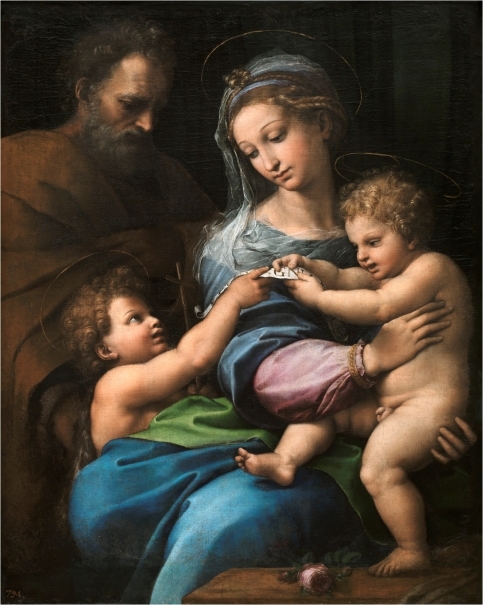 In addition to producing work in Raphael’s name, such as the Small Holy Family and its cover which was painted for one of Raphael’s closest and most influential patrons, Cardinal Bibbiena, Raphael’s young assistants began to paint pictures which, while frequently based on or assembled from Raphaelesque motives, do not seem to have originated directly with the master but instead represent independent productions. These presage their work after the master’s unexpected death in 1520. This section opens with Giulio’s independent work on this scale and within this category produced during Raphael’s life-time. It continues on the end and facing walls with Penni’s independent work both before and after Raphael’s death. It shows the individual characters and limitations of these young artists, and allows one to better appreciate their roles in the larger collaborative works in this exhibition. 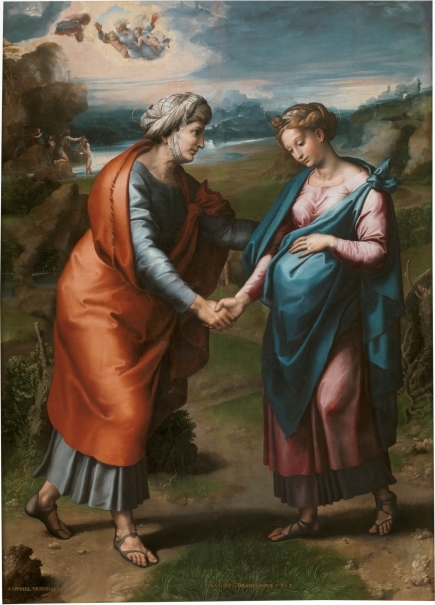 Giulio’s earliest independent activity was encountered in the previous section, and his work as Raphael’s principal assistant can be seen in pictures throughout the other thematic sections of the exhibition. 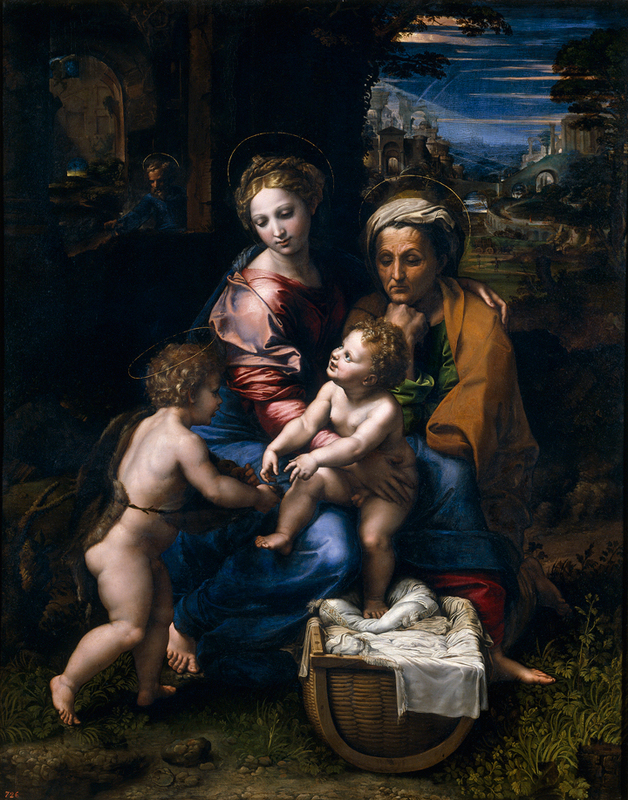 But while Penni’s independent activity producing easel pictures can be placed in the category of Small Madonnas and Holy Families, Giulio was a more ambitious and versatile painter. The works in this section are representative of the ways in which Giulio’s work developed when it was not constrained by Raphael’s guidance. The Dëesis (Christ in Glory with Saints) from Parma was probably commissioned from Raphael, but the surface execution is entirely by Giulio. 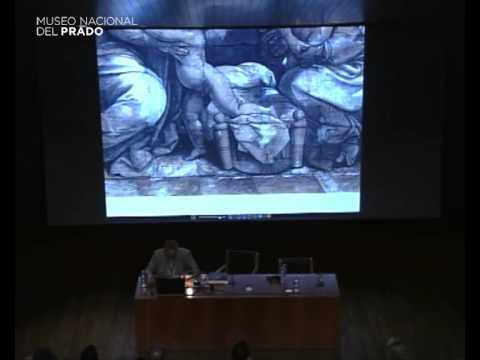 It is the picture that best represents his surface handling at the very end of Raphael’s life. The cartoon of the Stoning of Saint Stephen was made in preparation for an altarpiece in Genoa which was also apparently commissioned from Raphael but only furnished after his death, including numerous changes introduced by Giulio. The Flagellation from the church of Santa Prassede in Rome was commissioned from Giulio by Cardinal Bibbiena, although its attribution remains controversial and some scholars claim that it is a later replacement of a lost painting by Giulio in which execution Caravaggio participated. Oil on panel, 59,7 x 43,8 cm, h.
Raphael transformed Renaissance portraiture, expanding the range and possibilities of the genre in ways that had not been anticipated by any other artist. His portraits can be divided into two groups: official portraits and portraits of friends. The official portraits of cardinals, the Pope, and other prestigious sitters were commissioned works, sometimes executed under intense timepressure. Some of these, or some parts of these, were delegated to Raphael’s workshop, and Raphael may not have particularly relished painting these portraits. The second group comprises portraits that Raphael painted of his friends, perhaps as gifts and possibly without receiving payment. In these portraits, which are of the highest quality and in which workshop assistance cannot be detected, Raphael’s originality is found in the painterly execution rather than in their form. 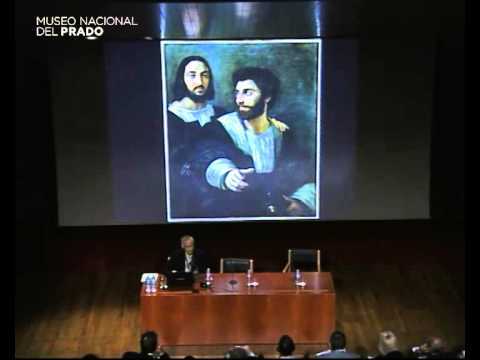 They are predominantly painted on canvas and are amongst the artist’s greatest masterpieces, especially for their exploitation of the properties of painting on a canvas support. In his Self-Portrait with Giulio Romano which was probably the last portrait that Raphael painted and which serves as his artistic testament, Raphael combined compositional inventiveness with innovative execution while also commemorating his quasi-paternal relationship with Giulio Romano. 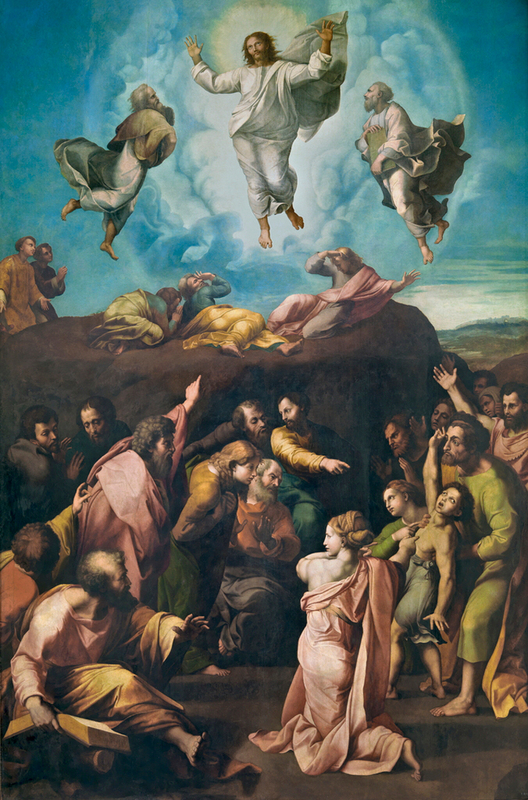 The Transfiguration was commissioned from Raphael by Cardinal Giulio de Medici, probably late in 1516, and was intended for his cathedral at Narbonne. Sebastiano del Piombo persuaded the Cardinal to commission a second, rival, altarpiece for the same location. The Transfiguration was completed just before Raphael died and was retained in Rome as a result of his unexpected death. It is now in the Musei Vaticani. 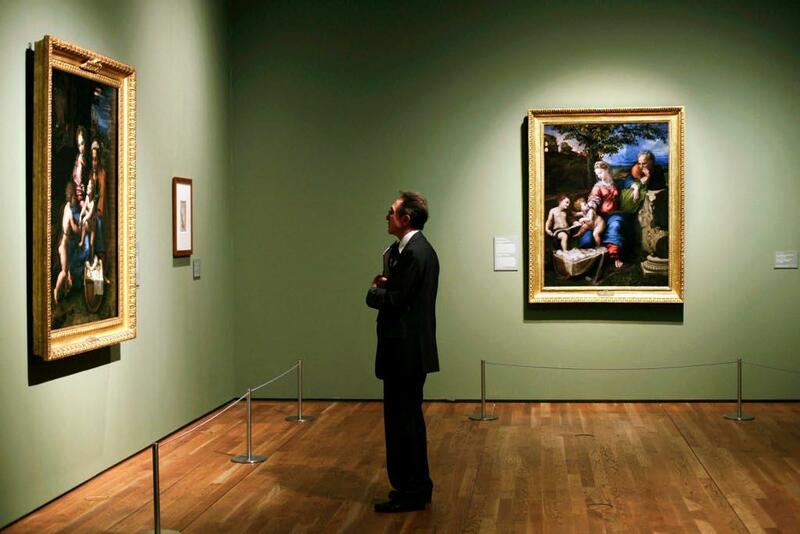 Sebastiano’s picture was sent to Narbonne, and is now in the National Gallery, London. 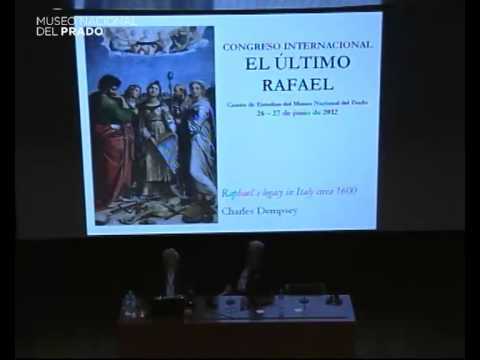 Raphael’s workshop was engaged to produce a replica of Raphael’s original, and this picture made its way to Spain in the seventeenth century. 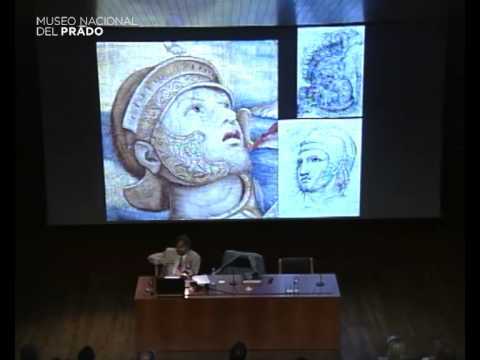 It is shown here with thirteen drawings that were produced by Raphael (and Giulio Romano) as Raphael planned the original painting and which were presumably available to Raphael’s workshop when they were working on this variant. 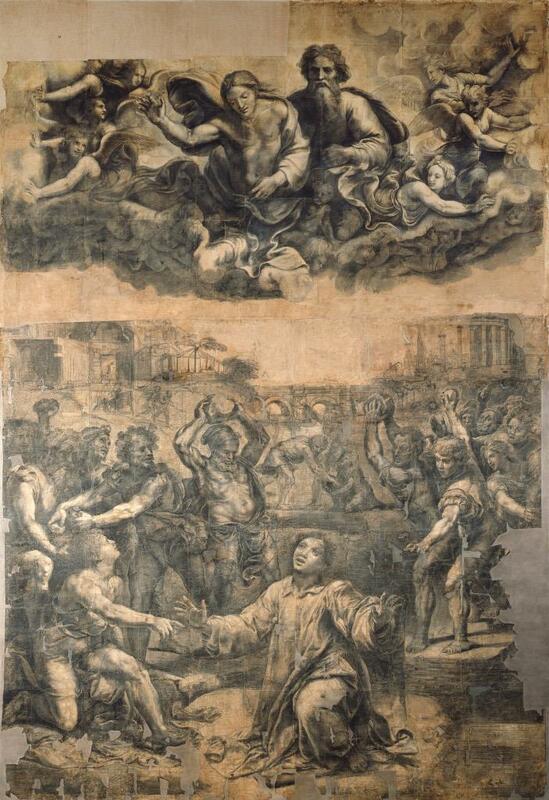 Seventeen drawings, either originals or copies, are known for the Transfiguration and, as a result, one can trace its development in some detail. 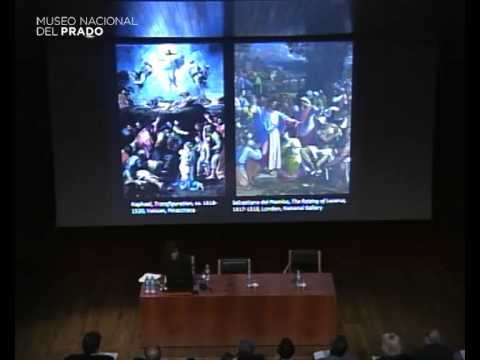 The sequence shows how Raphael realised that he could increase the drama of his picture by combining the Transfiguration with the appearance of the possessed boy to the apostles who have been left behind as Christ ascends Mount Tabor (the two episodes follow in the gospels, but no previous artist had combined them). The catalogue includes introductory texts and three scholarly essays. 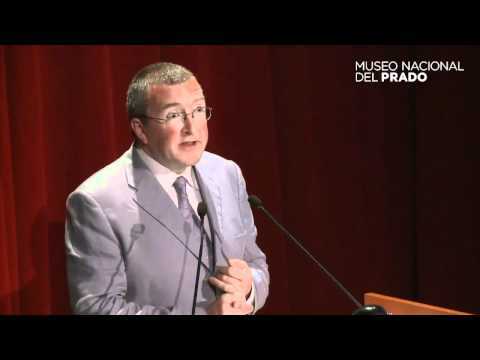 The first essay is jointly written by the exhibition’s two curators, the art historian Tom Henry and Paul Joannides, Professor of Art History at Cambridge University. 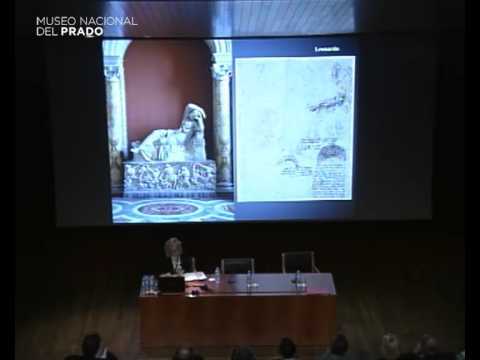 The second essay is written by Ana González Mozo, researcher in the Technical Documentation Department of the Museo del Prado and the third one by Bruno Mottin, Élisabeht Ravaud, Gilles Bastian and Myriam Eveno from the Centre de Recherche et de Restauration des Musée de France. In addition, the catalogue includes 50 entries that cover all the works in the exhibition, grouped into coherent sections.